Vic Roads is highlighting the dangers of using bullbars on All Wheel Drive vehicles in cities and suburbs of Australia. 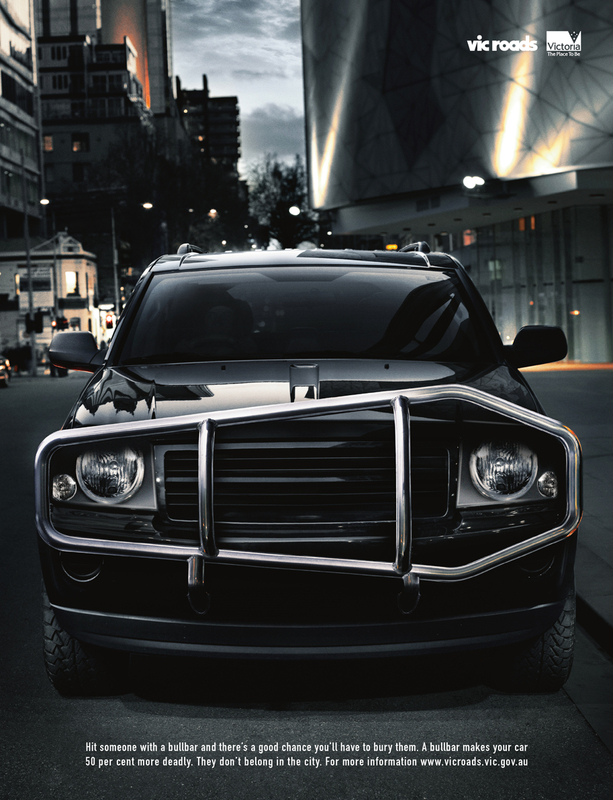 A sports utility vehicle drives through the streets of Melbourne, it’s front bull bar in the shape of a coffin. Bullbars are used in rural areas of Australia to protect vehicles in collisions with trees and animals such as kangaroos. They protect the cooling system and reduce the chances of a driver and passengers being stranded. Bullbars are also used, with winches, to recover other vehicles, animals or equipment. In the suburbs and city it’s another matter. The Bullbar advertisement was developed at Marmalade Melbourne by creative director/copywriter Neil Mallet, art director Frank Trobbiani and photographer Chris von Menge.